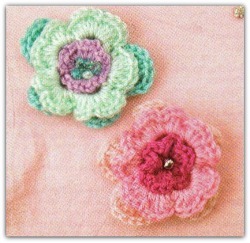 "Dawn" is a crochet flower pattern that is so easy even beginners can make it. With A, ch 5; join to form a ring. Rnd 1: In ring work [sc, 5 hdc] 5 times-5 petals made; join in first sc. Fasten off. Rnd 2: Join B around post of any Sc; ch 1, sc around same sc; ch 3; *sc around post of next sc, ch 3; rep from * 4 times more; join in first sc. Rnd 3: SI st in next ch-3 sp, in same sp and in each rem ch-3 sp work (sc, 5 dc, sc, 5 dc, sc)— petal made; join in first sc. Fasten off. same sc; ch 4; *sc around post of next sc, ch 4; rep from * 4 times more; join in first sc. Rnd 5: SI st in next ch-4 sp, in same sp and in each rem ch-3 sp work (sc, hdc, dc, 3 tr, dc, hdc, sc) ­petal made; join in first sc. With sewing needle and matching thread, sew bead to center of flower.